For the Canadian filmmaker, see Rob Stewart (filmmaker). 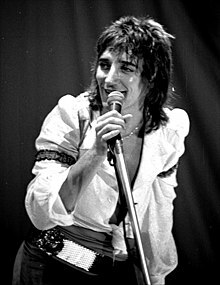 Rod Stewart (10 January 1945) is a British pop singer. He was born in London to an English mother and Scottish father. When he started singing in the 1960s, he was player for Brentford F.C., a football team. He started singing in local R&B groups, in the 1970s he began a solo career which made him very famous. This page was last changed on 12 December 2018, at 17:35.